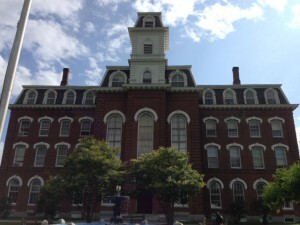 College Hall is VCFA’s iconic building. I just returned from almost two weeks at Vermont College of Fine Arts, where I served as a graduate assistant for the summer residency. Today, I sent my first semester students back home ready to work on their monthly assignments (called “packets” and including 10-15 books to read and annotate, two short critical essays, and 40 pages of new and/or revised creative work). Most of them will have to turn in their first packets sometime between August 3 and 10. It sounds like a lot of work, but I didn’t tell them that I have my own August 8 “packet” deadline that involves 237 pages of revised creative work — namely my second revision of SURVIVING SANTIAGO for my editor. I knew it would be a tight deadline, now made even tighter by the fact that I spent four days revising the first two pages. In my defense, the first two pages are generally very important pages in a novel. 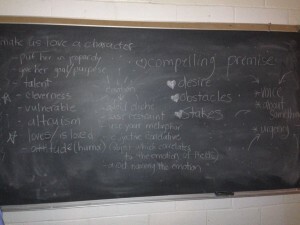 Notes on character likability from a workshop. This was the biggest craft issue I explored in my time at VCFA. While I helped to introduce the first semester students to the process of VCFA’s low-residency MFA, much of my work consisted of helping the graduating students with their lectures. This was an especially gratifying task for me because this graduating class, the Allies in Wonderland (each class comes up with its own name), is the most culturally diverse class to graduate from the program. 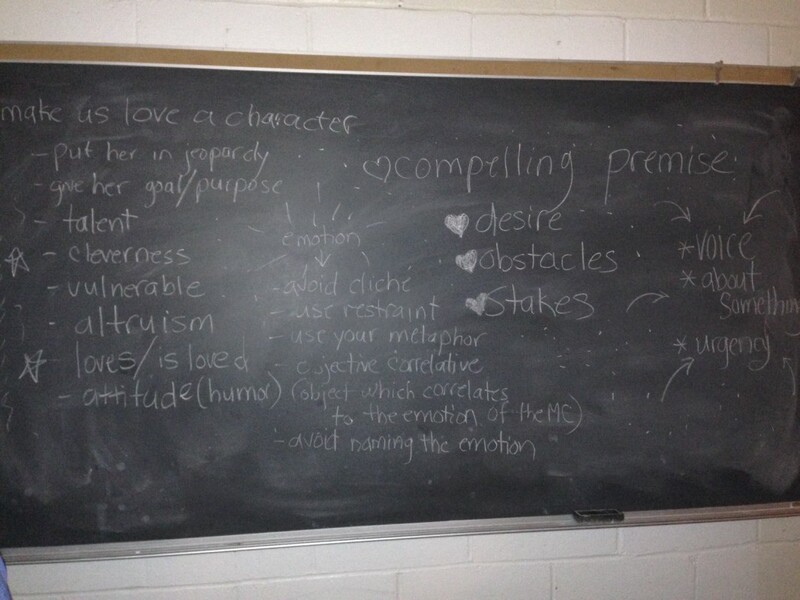 And while one or two lectures each residency focus on diversity — my lecture, for instance, advised writers on how to present protagonists and major secondary characters with disabilities — six graduate lectures (out of 25) explored diversity-related themes. Heidi Kim began the discussion with a lecture titled “Climbing into Culture: Narrative Approaches in Bicultural Stories,” which compared and contrasted protagonists who served as cultural interpreters, were “strangers in a strange land,” and/or were cultural chameleons. I was especially interested in what Heidi had to say because my protagonist in Gringolandia, Daniel, is very aware of his position as a cultural chameleon, while his sister who narrates SURVIVING SANTIAGO immigrated to the U.S. at a much younger age, so that when she goes to visit her family in Chile years later, she is very much a stranger in a strange land. 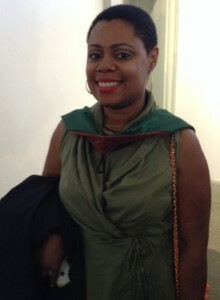 Ibi Zoboi, MFA, with her hood and diploma. Two days later there were a pair of diversity-related lectures. LoriGoe Pérez-Nowak, who was in a workshop with me her first semester and my graduating semester had a very personal take on mixed-race identity in her lecture “Taking the Pulse on Identity: Writing Your Mixed Race/Mixed Heritage Character.” Following LoriGoe was Ibi Zoboi, the creator of the Brooklyn Blossoms Book Club, who lectured on “Brown Girl in the Ring: Magic for the Marginalized.” She writes speculative fiction and her focus was on speculative genres (sci-fi, fantasy, magic realism) and how they are rooted in the mythology, folklore, and literary canon of communities of color. Following her lecture, Ibi and I talked about blogging, and she plans to explore these themes further, as well as diversity in children’s literature in general, on her soon-to-be-revamped blog. I look forward to her joining the conversation, which is ongoing with contributions by Zetta Elliott on Fledgling, Edi Campbell on Crazy Quilts, and the folks at Rich in Color, among others. Ibi Zoboi celebrates her graduation with her daughters and former advisor Coe Booth. This afternoon, the 25 Allies in Wonderland received their MFA degrees, and for their class gift, they endowed a scholarship to help fund the education of up to two writers of color each semester who enroll in the VCFA program. 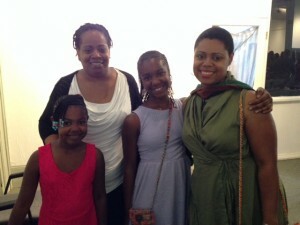 Their generous gift goes a long way to expanding the pool of children’s authors of color who can write from the inside. Rated the number one low-residency program for children’s writing, VCFA prepares writers with an emphasis on craft and process, and graduates have the inside track when it comes to submitting manuscripts to agents and publishers. 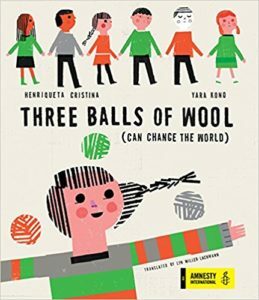 Thus, the graduating class’s gift and the knowledge base created by these lectures represent concrete measures to attain the goal of #WeNeedDiverseBooks — stories about all our children, written by authors who come from their communities. Great report, Lyn! So glad you got a chance to go. I wish I could have attended residency. I miss being there. I’m so happy for the graduates! They were a great group, Linda! I just heard that they’re going to move the Alumni Mini-Rez to a different week, not connected to the residencies, so the only way to get to know the new classes and see all the faculty from now on will be to become a GA. However, the AMR will still feature the craft lectures, and some of the faculty will be invited. Wow, that sounds like a great line-up Lyn. I’m sorry I missed it! The recordings of the lectures are now available to you for free as a VCFA alum, and so are the handouts. Check them out! Lyn, what a rich experience to see those students graduate who were just beginning their journeys when we graduated. Thank you for the wonderful overview of the lectures that featured topics on diversity. How amazing that they endowed scholarships! What a brilliant idea. Thank you for your comment, Laura! I hope you get a chance to work as a GA. It was a wonderful experience, and I’m especially glad to see this class graduate, since they started in our last semester, and my final workshop had three students from that class. I see that I have many lectures to look forward to! Fantastic. You certainly do, Sandra! Check out the full list, because there were some other great lectures too. I’m going to have to listen to some because I could only be at 13 of the 25 because of my Tech GA duties. Great post, Lyn! That top picture is from my workshop and I got all the residency longings when I saw Martine’s handwriting! I didn’t know which workshop it came from, but I’d guessed Martine. The hearts were the big clue. You’re lucky to have had a workshop with her, Tirzah! I’m hoping to work with her on a postgraduate semester. 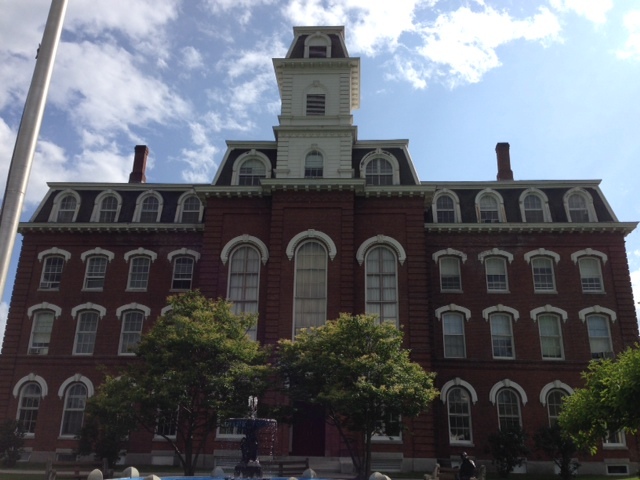 I graduated from VCFA way back in 1993. Reading your article brings back memories. It was a great experience. Maybe someday I’ll go back for the graduate seminar. Thank you for writing, Nicki! Were you in the Fiction Writing program? I considered the dual program since I’ve also written for adults, but my budget couldn’t handle the extra semester. However, I’m considering a post-graduate semester. Hi, Lyn. Yes, I was in the Fiction Writing program. One of my friends did the post-graduate semester recently and enjoyed it a lot.